C-Line is proud to present an extra-large, durable on-the-go document case. The letter size case contains strong, acid-free archival quality polypropylene material, capable to secure your important materials through any type of environment. Polypropylene material means there are no photocopy transfer giving the best protection for your hard work. The case features heavy-duty sewn edges with an elastic closure for the maximum durability. The gusset design can expand to hold up to 1,000 sheets. 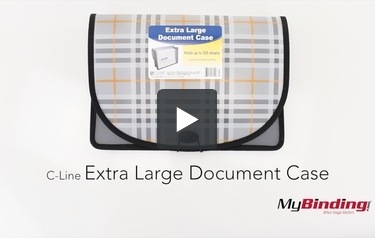 The poly expanding document case is the premium product for transporting multiple legal size documents in one convenient carrier! This is the C-Line Extra Large Document Case! It is held closed by a stretchy strap, and undoing allows for some magical moments of holding lots of paper. And I mean a lot—about two reams of paper…that’s 1000 sheets. Though with that many pages, I can’t guarantee that the strap will hold closed—that’s probably why C-Line only says it holds 500. In the front, under the cover, is two business card sized slots for convenient labeling, or for holding your schedule. It’s made of both plastic and fabric, although it’s an artificial fiber used, but it’s weaved nonetheless. It comes in patterns like this, and also other solid colors.